The public is invited to join community, business and civic leaders at an open house Monday, July 30, to learn details about the Aug. 27 launch of plans to significantly improve the Interurban Transit Partnership (“The Rapid”) Route 19 service along the Michigan Street corridor, as well as plans to improve the DASH service provided by the City’s Mobile GR and Parking Services Department. The forum is from 11-11:30 a.m. Monday, July 30, at The Rapid Central Station Board Room, 250 Grandville Ave. SW, Grand Rapids. The event kicks off with a 15-minute presentation by The Rapid Marketing & Communications Manager Michael Bulthuis and Mobile GR and Parking Services Transportation Planning and Programs Supervisor Hank Kelley, followed by a 15-minute question-and-answer session. The open house will highlight how the introduction of free fares along the new and improved Route 19 will – in combination with the City’s fare-free DASH service and City-sponsored fare-free portion of the Silver Line north of Wealthy Street – essentially allow free travel throughout downtown Grand Rapids without the hassle of parking. Another feature is the convenience of buses coming every 10 minutes on Michigan Street during peak travel demand. The new fare-free Route 19 runs along the Michigan Street corridor from Plymouth Street in Northeast Grand Rapids and continues west along Heritage Hill and the Medical Mile to the City’s near West Side along Bridge Street up to Stocking Avenue. The route includes stops near such anchor institutions as Spectrum Health, Grand Valley State University, Grand Rapids Community College, Michigan State University’s College of Human Medicine and Meijer’s soon-to-open Bridge Street Market. The Rapid’s public transit service upgrades along Route 19 are part of a new three-year pilot program partnership funded with support from the City’s Mobile GR and Parking Services Department and Spectrum Health. The aim of dramatically increasing Route 19 bus service is to help reduce traffic and ease parking congestion along the Michigan Street corridor, which is the City’s most heavily trafficked thoroughfare. From Monday through Friday morning (there is no weekend service) on Route 19, The Rapid buses will come every 10 minutes from 5:20 a.m. to 8:41 a.m. Between 8:42 a.m. and 3:20 p.m., The Rapid buses on Michigan Street will come every 15 minutes. When peak demand resumes from 3:21 p.m. to 5:40 p.m., buses will again come every 10 minutes. 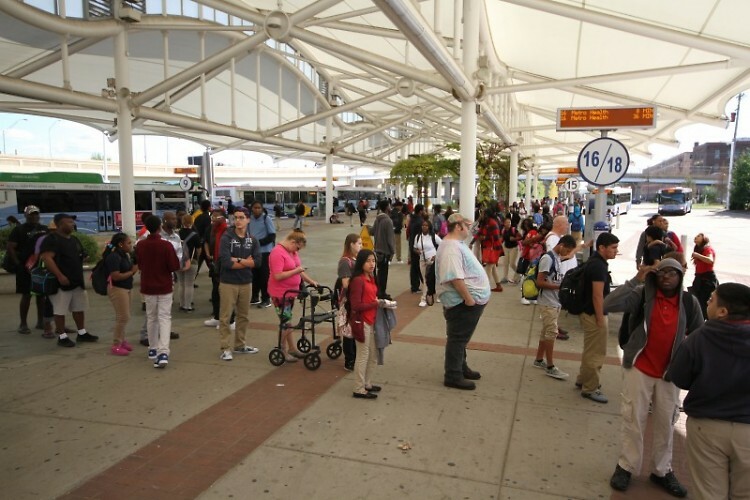 Afterward, from 5:41 p.m. to 10 p.m., The Rapid buses will come every 15 minutes. The public is encouraged to ride The Rapid to attend Monday’s open house. But free parking is available in the Amtrak lot at 440 Century, which is owned by The Rapid and located just south of Central Station. For more information, email The Rapid: [email protected].